Both the yeast strain and the method of its design could help overcome a significant bottleneck in the biofuels pipeline — namely, that the powerful solvents so good at breaking down biomass also sometimes hinder the next critical step of the process, fermentation. Lead author Quinn Dickinson, a research specialist at the University of Wisconsin–Madison’s Wisconsin Energy Institute and GLBRC, and senior author Jeff Piotrowski, until recently a GLBRC scientist, focused their efforts on ionic liquids — solvents that can deconstruct different kinds of biomass into relatively pure streams of the plant’s sugar but which are also toxic to the kind of microorganisms that ferment those sugars into fuel. 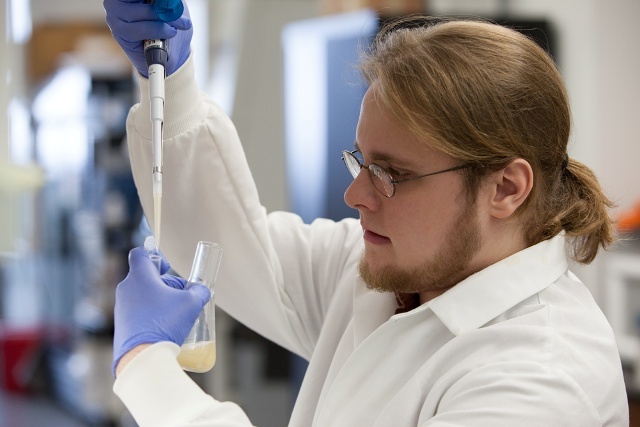 Using a technique called chemical genomics, Dickinson and Piotrowski set out to engineer a yeast strain that could tolerate ionic liquids. By identifying a number of genes in an industrially relevant yeast strain that, when deleted, either made the yeast sensitive to ionic liquids or resistant to them, they were able to understand the precise nature of ionic liquids’ toxicity to yeast. This information guided them in successfully engineering a new strain of yeast that not only shows resistance to ionic liquids but also improves sugar conversion and biofuel production. Since removing residual ionic liquid after deconstruction is an added step incurring added expense, the new strain by itself could lower the costs of making biofuels. And yet the new yeast strain is really only one part of the finding. The technique they used to get there, chemical genomics-guided bio-design, is equally novel, and rich in potential for future applications. “What this work shows more broadly is that we can use chemical genomics to rapidly design new yeast strains in response to any new chemical compound, or any new solvent used as part of a new bioconversion technology,” Dickinson says. The GLBRC is one of three Department of Energy Bioenergy Research Centers created to make transformational breakthroughs and build the foundation of new cellulosic biofuels technology. But Piotrowski points out that the bio-design technique could be of use beyond the realm of biofuels.